Ronnie Tjampitjimpa was born in Tjiturruya, Western Australia. His family moved around their country, and in December 1956 walked from the Dovers Hills to Haasts Bluff, in order to escape harsh droughts. During his time here he worked as a stockman. He and his family later moved to Papunya where Ronnie was exposed to the beginnings of the Aboriginal Art movement. In 1971, Ronnie commenced painting and was one of the youngest artists as the settlement. Ronnie's work entails the Pintupi style of strong circles, joined by connecting lines depicting the people, the country and the Dreamtime. The primary images in Ronnie's work are based on the Tingari Cycle which is a secret song cycle sacred to initiated men. The Tingari are Dreamtime Beings who traveled across the landscape performing ceremonies to create and shape the country associated with Dreaming sites. The Tingari ancestors gathered at these sites for Maliera (initiation) ceremonies. The sites take the form of, and are located at, significant rockholes, sand hills, sacred mountains and water soakages in the western desert. Tingari may be poetically interpreted as song-line paintings relating to the songs (of the people) and creation stories (of places) in Pintupi mythology. Ronnie can be considered amongst the first wave of artists effectively linking such ancient stories with modern mediums. 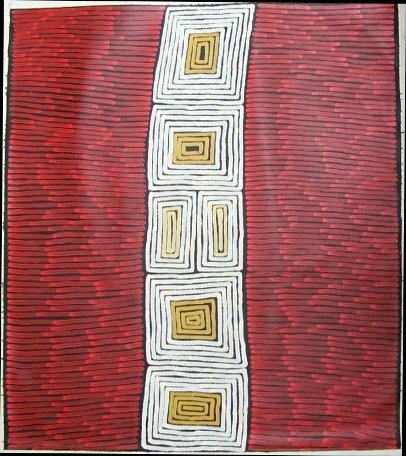 As a founding member of Papunya Tula Artists, Ronnie's work was an important influence on the desert movement, however during the early eighties Ronnie only painted occasionally for the group. During the late eighties and early nineties however, Ronnie moved on from the fine dot paintings of his early career, and began to use bold colours applied to the canvas in strong, pulsating lines - a move which was to gain significant attention. Ronnie has been exhibited widely throughout the Australia and internationally, and in September 1988 he won the Alice Prize. Flinders Art Museum Flinders University, Adelaide; Embassy of Australia, Washington, U.S.A.; Fine Arts Museums of San Francisco, U.S.A.